The real strength of our union for many workers across the public, health and NGO sectors is the personal and responsive relationship organisers maintain with you the member which is made possible through our ratio of 1 organiser for every 500 members. In keeping with our membership directed philosophy the Executive recognizes the importance of regular contact and access to the expertise of our organizers who are employed to maintain and promote the interests of you the member in your workplaces. 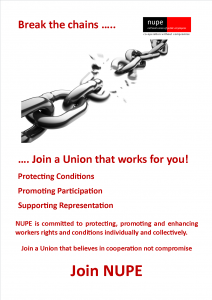 When you contact NUPE you can speak or communicate or meet with the organizer responsible for your area who can assist you with any query in your workplace or area. As a member you are kept up to date regarding information or activities that concern you. Issues and matters that are relevant to our varied NUPE members are disseminated through regular and occasional (special topic) publications by the responsible organizer which you are encouraged to feed back about. This membership directed philosophy means that major decisions affecting you are made only with your consent. The democratic structure of NUPE is reflected in the ratification process of workplace employment agreements, policy matters and consultation processes which must be agreed to by NUPE members as a whole. Self determination for all our membership is valued and protected through our ratification process which requires that in any negotiations that no single occupational group is able to settle until all groups covered by the bargaining are ready to settle. The votes of one group cannot be used to outvote a smaller group within the same collective employment agreement and we work hard to meet the interests of all the membership. Our membership directed approach works best and provides the most influence for members when you are actively involved in your workplace issues and in building the union as a member or a delegate. As a members you elect your own leaders and delegates and vote on your own employment agreements and issues affecting your workplace. All members have access to the services of a legal advisor through the Union’s legal policy, which may include representation at the Mediation Service, Employment Relations Authority, the Employment Court, Coroner’s Court and Nursing Council. This legal resource allows members and the Union to pursue outcomes at the lowest level, which can be of most benefit to you from a financial, professional and personal perspective. It is provided under the legal policy as part of your annual membership fee.